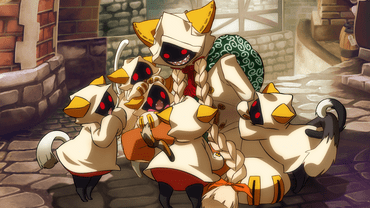 Taokaka is part of the Blazblue Series and comes from two words, Tao and Kaka. Tao to mean short and Kaka, to refer to a tribe. So Taokaka, is a short cat girl who belongs to the Kaka tribe. She is putting on a large coat that covers her true face, only leaving a row of teeth and her beady red eyes. It is still a mystery if that is her true face. She is determined to go back to the sky, above her village, which she believes was closed by city buildings made by humans above her village. 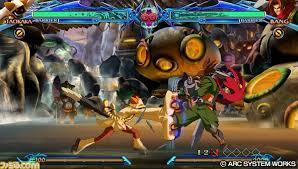 It was not long when Taokaka was sent by an elder to retrieve the bounty on the head of Ragna. In the process, she becomes a vigilante. Despite her determination, she is substantially obsessed with food and at the same time forgetful, regularly falls asleep on impulse, and becomes hungry faster after eating or forgetting information immediately after hearing. Taokaka and Litchi are good friends and she refers to her as 'Boobie Lady' with a lot of affection. While she does not seem to refer to other characters by name other than herself; she calls Noel 'lacking lady', Ragna as 'good guy' and Jubei as 'Cat person'. Unfortunately, she is not able to identify that Ragna is the good guy, who buys him food and 'Rawrgna' the criminal, are one. Apparently, the kaka tribe that she comes from is genetically engineered from Jubei' genes who was among the 6 heroes. Interestingly, in her clan, they cannot reproduce more than a hundred members. Taokaka displays a physical strength that is superhuman by being able to fight continuously other players without showing any signs of being exhausted. She is also able to survive a fall from the top of Kagutsuchi. As the Continuum shaft ends, Jubei asks her to travel with Ragna.